The principal aim of the European project DREAM, financially supported by the European Commission’s Horizon 2020 program, was to apply the development and description of a novel series of technological innovations in traditional ceramic tile furnaces and new-generation furnaces to facilitate implied progress in the ceramic process sustainability. To show these advances “in situ,” three industrial demonstrators that can act as technological models for the market have been developed. In this system, and with respect to the environmental system, the Instituto de Tecnología Cerámica (ITC) built a test plant with a bag filter containing reagent injection and two compact bed reactors to focus on the study of acid pollutants, intending to decrease the release of these and other types of toxic elements into the air. Designed by ITC technicians, this pilot plant has been set up since July 2018 at the KERABEN group facilities in Nules (Castellón), and within a short period of time, it will start working to achieve different measurement campaigns that will last until the summer of 2019. This experimental research renders it feasible to achieve abatement efficiencies for the various configurations of the plant. Hence, the pilot plant includes new-generation monitoring systems that will enable obtaining information on the pollutant emissions in an industrial setting in real time. DREAM, or “Design for Resource and Energy efficiency in ceramic kilns,” merges a few leading European companies in the ceramic technology field. Its aim is to promote the use of some remarkable advancements in kilns for the manufacture of ceramics. The key concept of this project was to lower the energy use in furnaces, manufacturing cost, and pollutant emissions and enhance the quality of the end product. 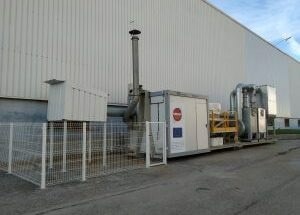 The five strategic innovations applicable to the new kiln that would be developed within the project are as follows: the study of a device for modeling, simulation, and control of the cooking parameters; a biofuel-fed CHP unit; implementation of the use of a heat exchanger to reuse and control heat; monitorization and reduction of the emissions from kilns; and setting up new refractory materials and coatings to improve kiln isolation. In total, 11 partners were involved in this project, led by Sacmi, world manufacturer in ceramic kiln production, supported by the guidance of CRIT, Italian company dedicated to technology innovation. A few global developers in their field involved in the DREAM team are Keraben Grupo (Spain) and Mirage (Italy), both chief producers of ceramics; Rath (Germany) leading manufacturer in the refractory sector, supported by the conational research institute Forschungsgemeinschaft Feuerfest; the Instituto de Tecnología Cerámica (ITC-AICE), center for the university–business cooperation in the Spanish ceramic cluster network and Econotherm (UK), specialized in the production of heat exchangers, supported by the research of Brunel University London; and the useful contribution of the Italian University of Modena and Reggio and Synesis, a company specialized in the manufacturing process design.